(Natural News) The clearest indication yet that the “Deep State” is real and not some figment of a conspiracy theorist’s imagination was revealed Monday evening by a Texas lawmaker in an interview with Fox News. 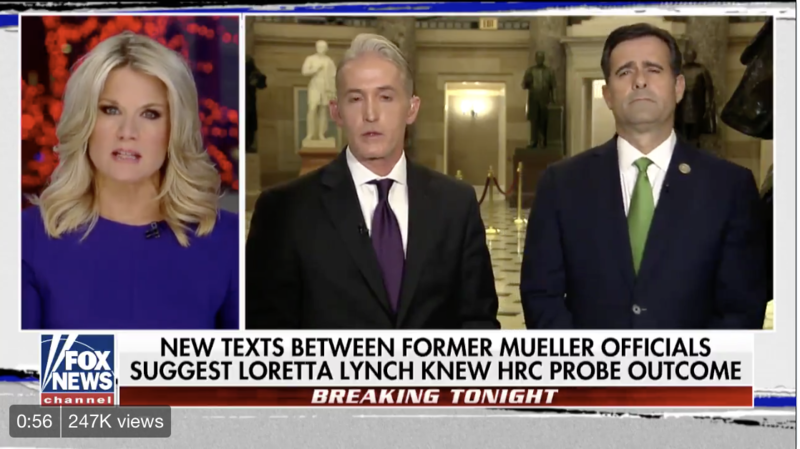 In an appearance with Martha McCallum, Rep. John Radcliffe, along with Rep. Trey Gowdy, R-S.C., said they and their staffs had reviewed some 50,000 text messages between disgraced FBI counterterrorism agent Peter Strzok and his mistress, FBI lawyer Lisa Page that Attorney General Jeff Sessions had made available. After poring over those messages, Radcliffe made a stunning statement regarding their contents. “There’s certainly a factual basis to question whether or not they acted on that bias. We know about this insurance policy that was referenced in trying to prevent Donald Trump from becoming president,” he continued, as reported by The National Sentinel. Let that sink in for a moment: A “secret society” of Deep State operatives within agencies of the U.S. government — not some second-tier authoritarian power or third-world banana republic. Radcliffe’s stunning statement came amid calls from Republicans and tens of millions of Americans for a second special counsel to investigate what very clearly appears to be a massive abuse of our justice and intelligence systems for the sake of thwarting a duly elected president. You couldn’t script this any better as a Hollywood political thriller. And let’s not forget, this batch of text messages isn’t even the full load from these two anti-Trump sycophants. Reports on Monday claimed that the FBI somehow ‘lost’ five months’ worth of text exchanges between Strzok and Page — a period of time in which many things occurred that regarding Trump, his administration, his transition, and a potential case of fired FBI Director James Comey lying under oath. “I have spoken to the Inspector General and a review is already underway to ascertain what occurred and to determine if these records can be recovered in any other way. If any wrongdoing were to be found to have caused this gap, appropriate legal disciplinary action measures will be taken,” he continued. Many Republicans are incredulous that an agency as advanced technologically as the FBI could just “lose” text messages — especially given the agency’s expertise in the forensic retrieval of electronic data. And yet, like we were supposed to believe that Hillary Clinton’s 33,000 emails she never turned over to investigators and the IRS’ loss of data in the scandal involving the targeting of conservative groups before the 2012 election, now we’re expected to swallow this whole as well. These same lawmakers have been screaming for Jeff Sessions to appoint a second special counsel to look into all of this; I agree. He should put his investigators first on Radcliffe’s allegations because to date those are the most serious, as well as the biggest confirmation thus far that a “Deep State” not only does exist but serves to undermine our republican (small “r”) form of government.